Stained glass windows are one of the delights of any ecclesiastical building and most deserve careful study with a pair of binoculars. Early windows were generally instructive, depicting Biblical stories and the lives of saints, but in recent centuries stained glass has also been used to create memorial windows. Those in St Bartholomew’s have been produced using two main techniques. Glass can either be coloured by metal oxides whilst molten or it can be painted with vitreous enamel. Over the centuries these methods have been modified to give the glass a greater degree of subtlety in both colour and shading. There are two small windows which contain coats of arms. Both are 17th century and made of painted glass. The first coat of arms (above) is in the east window of the Lady Chapel and appears to be that of Major Thomas Lennard (1577-1635). He was the third son of Samson Lennard of Chevening and his wife Margaret Fiennes, Baroness Dacre, whose family can trace its roots to the Norman Conquest and beyond. 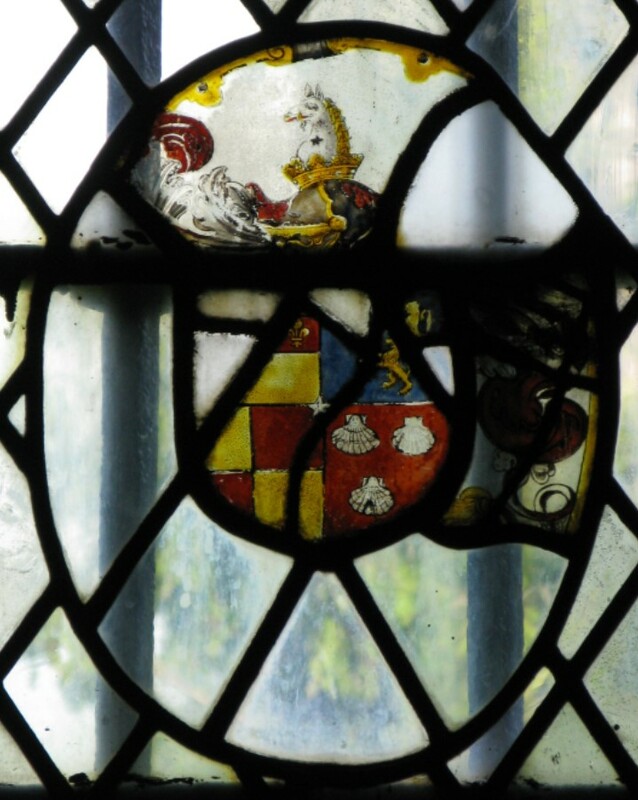 Sampson was an MP and High Sheriff of Ken t. This window was damaged and unfortunately some of it has been lost, hence the partial nature of some of the panes. The second in the north wall of the Nave (right) shows the arms of David Polhill (1577-1658), Sheriff of Kent. 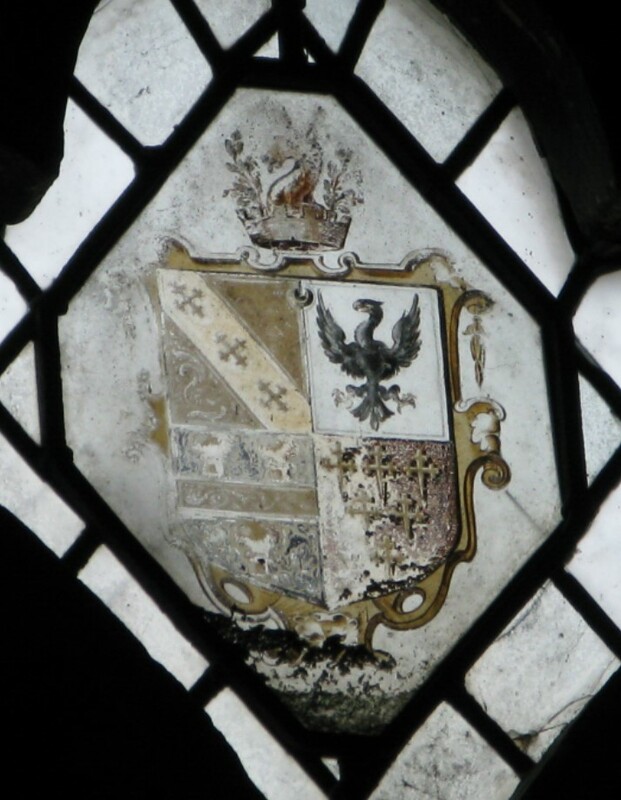 Clockwise from top left it shows the arms of the Polhills, then his great-great-grandmother Alice Buckland, next his grandmother Ales Sandbach and finally his wife Margaret Theobold. As soon as you enter the church, your eyes are drawn to the large expanse of the East window which features on the front cover of this month’s magazine. It has a design which is unique to Otford. I found at first that I focused on the cross, made up of seven panels of painted glass, the central one depicting the crucifixion and the others featuring various saints. These panels have an interesting story behind them. As a young man, David Polhill (1674-1754), whose memorial is on the south wall of the church, took the grand tour of Europe. When he was in Rome in 1696 he bought these panels of seventeenth century painted Dutch glass. 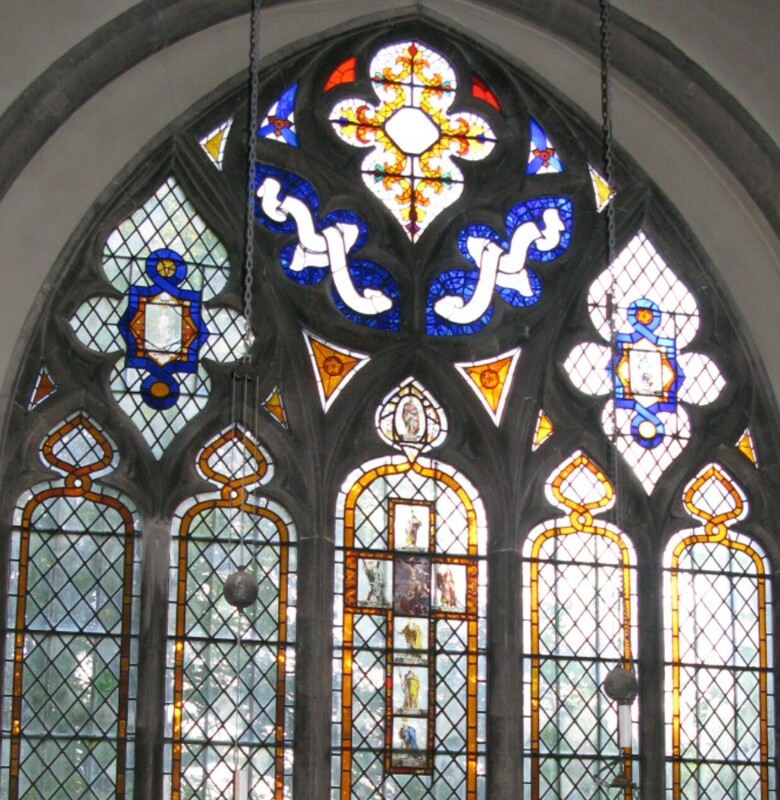 These panels were kept in the family for the next 150 years until his great grandson, Frederick Polhill, who served as curate of Otford, incorporated them in the East window in 1845. At the top of the cross is St. Paul, to the right (south) is St. James the Less, below are SS Philip, Thomas and Peter, and to the left (north) is St. Andrew. In the wider window above there are three more panels, featuring St. Matthias to the left, St. Bartholomew in the middle (appropriately enough) above the cross and John the Baptist to the right. Next time you are in the church, I suggest you take a close look at these panels to see if you can identify for yourself the saints with their symbols. However, the East window is not just about the cross and the saints who followed their crucified Lord. Rather, it is an Easter window depicting the hope and glory of the resurrection. Above the cross you can see white cloths against a dark blue background. These represent the grave cloths that would have been wrapped around Jesus body when he was taken down from the cross and laid in the tomb. However, in this window they are unravelled because Jesus has risen from the dead, leaving the cloths behind. Above the discarded grave clothes there is a depiction of the sun which shines with beautiful golden rays, especially in the early morning. This symbolizes the first Easter morning as darkness gave way to light and new hope and joy dawned upon the world with the resurrection of Jesus. This window was shattered by a bomb in 1940 which exploded nearby in Leonard Avenue. The pieces were painstakingly collected by the then Vicar Revd. Albert Elder and kept safely until the war was over. The window was then re-constructed in 1947. In the Winter months the East window is externally illuminated during evening services. This illumination is in memory of Don Marchant.